Pallas-Athena whose spear shaking came to be called Shakespeare; noteworthy because Francis Bacon’s “Conies” (Foul bird) aka “Knights of the Golden Helmet” wrote New Atlantis concerning America’s role to become the Phoenix of the “Golden Age”. America’s role is to be destroyed/purified by fire and renewed; I prefer the term “Scapegoat Babylon”. 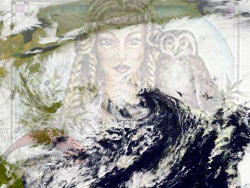 The Nor’Easter was named Athena, after the Greek Goddess of “Just War” on Election Night.. Democracy in action? Hardly, the U.S. has never been, nor will ever be a Democracy. Ancient Greece was the only Democracy and it failed from internal corruption just as America will. FEMA is filling a similar role to its role in Hurricane Katrina (Katrina=Catharine=Cathar=Discharge of Pent Up Emotion) is denying help to those most in need. FEMA is “Culling the Herd” while transferring the financial burden from insurance companies to U.S. taxpayers via FEMA Federal Flood Insurance. Hurricane Sandy arrived onshore as “Super Storm Sandy” by design. Recall, every State in the Northeast applied for Federal Disaster Relief ahead of the storm. U.S. taxpayers will foot the bill to tear down beachfront property and rebuild it for those who can afford it. Just like in New Orleans, watch who picks up the “Distressed” property. The story for 2 million+ homes without flood insurance, water or power is looting, flooding, black mold, cold and disease carrying rats. Te Nor’Easter is round two in creating “Order out of Chaos”. As we approach Veteran’s Day and Thanksgiving, remember veteran means “Beast of Burden”. WWI and the Korean War were postponed by “Armistice” and will have sequels. Likewise, Thanksgiving was a celebration of murdering natives in the Northeast with white men (crusaders / puritans) stealing their land and food, making slaves of them and worshiping a false god they referred to as “Providence”. Folks, Jesus is not “Providence” and does not need any “crusaders” to help establish Zion! Leave that to the Satanists. Obama has reportedly offered 123,000 Lockheed-Martin employees, due to be laid off, severance packages, courtesy of U.S. taxpayers in exchange for Lockheed sitting on the notices until after the election. Is this illegal? Not as severe as Iranian born Valerie Jarrett (Michelle and Barack Obama 20 yr mentor) negotiating with Iran’s Ayatollah Khomeini behind the scenes concerning their silent war, courtesy of U.S. Trade Sanctions; a “Culling of the Herd” affecting those in Iran most in need. Greece is voting on Austerity as America soon will; courtesy of the European Union, winner of the 2012 Nobel Peace Prize. Joseph Stalin was nominated for the Nobel Peace Prize by Satanist George Bernard Shaw (one of Anton LaVey’s favorite people) for starving 20 million Ukrainians. Obama received the award for expanding the Middle East wars he promised to end during his initial campaign. Do you remember the Greek Tragedy stage constructed for Obama’s nomination acceptance in Denver? Just before that, Hillary Clinton conceded on a stage surrounded by a U.S. Flag with all 50 state stars upside down! Those in tune with symbolism may remember George Bush gave his first press conference after the 9/11/2001 attacks in front of a U.S. Flag displayed upside down. This was after reading the book “My Pet Goat” upside down. C’mon.. another simple mistake? The 2008 Kentucky Derby was a real show stopper when Hillary placed bets on 8 Belles, the horse euthanized on the track after breaking both front legs crossing the finish line. 8 Belles means “Mutiny”. Hillary financed Operation Gun Runner through an off books account at the State Department called “US Direct Commercial Sales” and ran weapons to al-Qaeda, Ansar al-Sharia and the Free Syrian Army from Benghazi, watching the attack on arms dealer Chris Stevens via satellite. Now, who is the enemy? The U.S. is sitting on oil reserves in the Green River Formation, Bakken Formation, ANWR and Gulf of Mexico totaling several trillion barrels. Pipeline Oil is backlogging in Cushing Oklahoma and the world knows it. Natural gas and coal are in equal abundance. Rather than give relief at the gas pump, for the first year since 1949, America is exporting more oil than it uses to the tune of 500 million barrels a day. Brent Sea Crude Oil prices are higher than US Oil prices; the solution? Source oil in the U.S., refine and transport it abroad, and pocket the profits. Thank you Rockefeller (Standard, Exxon-Mobil, Chevron, American-Arabian Oil), Rothschild (BP, Anglo-Iranian Oil and Hugo Chavez (Citgo). Aren’t Iran and Venezuela American enemies? FEMA was in New York City on 9/10/2001. A planning document showed the Twin Towers in gun-sight cross hairs months ahead. SOUTHCOM was conducting a Haitain Relief Drill in Miami the day before the earthquake destroyed Port au Prince; NPR was in the remote interior of China when the Sichuan Earthquake hit; Obama bowed to Emperor Akahito months before the Fukushima reactor melt down; a 1997 NOAA planning pamphlet showed hurricane named Sandy making the same bizarre track Sandy took last week.